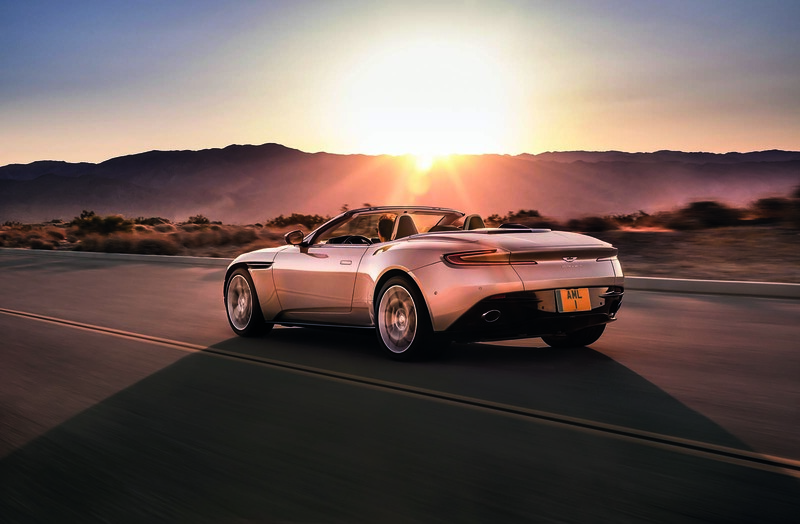 Aston Martin’s fast-expanding DB11 range has gained a new drop-top Volante version, powered exclusively by the AMG-sourced 4.0-litre turbocharged V8 engine. Aston says the new car is its sportiest open-top model yet. It has chosen to launch with the lighter V8 engine rather than a V12 to ensure handling is as keen as possible. It is understood that a V12 version is not currently in the product plan, but it would be a likely addition later in the car’s life. The V8 unit in the 2+2 DB11 Volante produces the same 503bhp at 6000rpm and 513lb ft at 2000-5000rpm as in the DB11 V8 coupé. It is connected to an eight-speed automatic gearbox and drives the rear wheels. 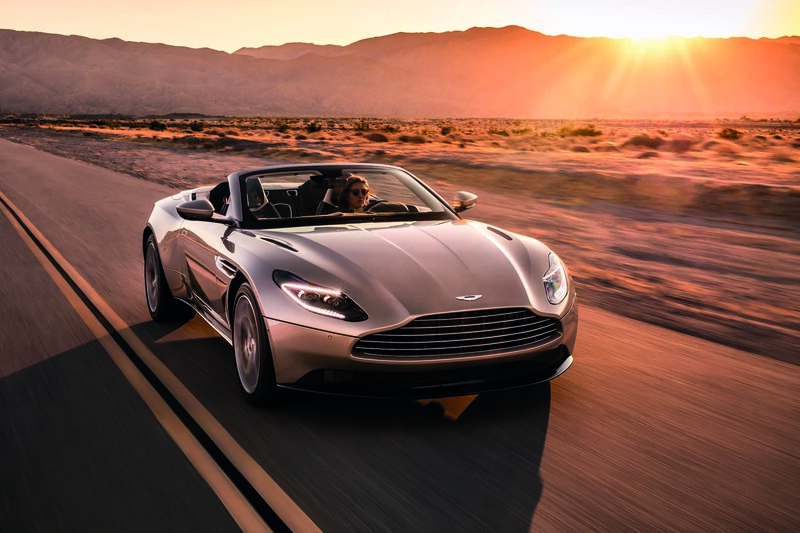 With a kerb weight of 1870kg, the DB11 Volante weighs 110kg more than the V8 coupé on which it is based. Aston says the DB11 Volante is some 26kg lighter and 5% stiffer than its V12-powered DB9 Volante predecessor. The weight distribution is claimed to be 47% front and 53% rear. The roof and its mechanism are a new design for Aston. The folding soft-top consists of eight layers and can be lowered in 14sec and raised again in 16sec. It can be operated at speeds of up to 31mph and specified in red, black silver or grey silver. The biggest design difference between the coupé and Volante — aside from the soft-top — is the absence of the aeroblades seen on the fixed-roof model. On the coupé, these sit at the base of the C-pillars (which have taken out of the Volante) and channel air over the rear end. On the Volante, the rear deck is new and the overall look, roof up or down, is more resolved and complete than that of the DB9 Volante. The DB11 Volante is on sale now, priced from £159,900 — an increase of £15,000 over a V8-powered DB11 coupé. Initial deliveries take place in the first quarter of next year. Personally, I like coupes rather than drop tops, but this really does look superb. Really accentuates the rear haunches! The more I see the db11 from the rear 3/4 the more I see an Austin Allegro. I think it's to do with the taper of the rear. Hmm. Awesome and, unusually, I prefer it to the Coupe. Someone else's engine in an "Aston" -- just NO. Can't even get the V12 -- an Aston engine -- in this -- the slippery slope seems to be gathering steam. A crying shame. Unusually, it looks better than the Coupe, though -- never liked the "roof strakes." I'd rather that Aston used their own engine, and getting the block off Jaguar or Ford appealed to me too. Walter Hayes was very much of the opinion that the block was something you could just buy in and use. As it turned out the straight six he got from Jaguar became unique to Aston, but as he said you couldn't drive in to a Jaguar garage and get it serviced. This Mercedes engine is a bit of a quandary. You can't argue that it's not a superb engine; it really is. Nor that Mercedes will have spent a fortune developing, testing, and ensuring it's longevity. Exactly the reasons why Hayes opted for someone else's block. Just in this case it comes with a few more parts associated with it too. The V12 (non-turbo) likewise is an extension of someone else's design, and it's beautifully smooth to drive. Aston really have adapted it to suit themselves without compromising parts which have been endurance tested by Mercedes already. Yes, it would be great if there was something that made the core of it absolutely unique to Aston, but I think with the V8 DB11 they're really showing how it should be used; in something of beauty. I predict the V8 Vantage will be awesome with this engine. So good it will make it look that Aston lent the engine to Mercedes to use! I'm with you on the "roof strakes". Actually, a lot of Marek Reichman designs are too fussy (Broguing on the seats!) and lack the timeless elegance of the Callum cars. Has to be made available with the V12, (it's bad enough that the AMG engine is being used). I still hark back to the days when Aston engines were handbuilt at Newport Pagnell. Each engine had a plaque with the name of its' enginebuilder. Every year my father used to send a Chritmas card to the guy who built the engine in his oscar india V8. I'm not a great fan of the DB11's looks as it appears a bit uncohesive, heavy looking and clunky while I think the excution of the front wheel arch and side vent is clumsy. The convertible version however makes the DB11 look a lot better although neither it or the coupe come close to their predecessor's sublime looks. Andrew Frankel, I wanted to reply to your piece regarding whether the use of "Other People's Engines" matters, but I can no longer find it. So... For me, regarding Aston Martin, an OPE is an absolute deal-breaker. Yes, most components in cars today are sourced from many places, but the engine is a rather significant part! The structure/platform (the bones) and the engine (the heart) must NOT be "other people's." Let's be clear -- Aston's 4.3/4.7 V8 was not merely "sourced" from Jaguar as you wrote, but rather was so comprehensively re-engineered by Aston for the Vantage that it shares essentially NO parts with the Jaguar engine -- it's unique to Aston. This AMG engine is merely an OPE, and that obliterates the appeal for me, no matter how good the engine may be. If I want an AMG engine, I'll buy an AMG car. I want my Aston Martin to have an Aston Martin engine. It need not necessarily be clean-sheet, but it can't be straight off-someone-else's shelf. Don't care who makes the engine. How often have McLaren won F1 world championships with other people's engines? Yet to suggest things like Aero dynamics and suspensions aren't important and it's only the engine that counts is ridiculous. How often have Red Bull used a poor engine only to win the WDC? Same applied to car like Astons. Having said all of the above it does matter to me where a car is made. For example and MG made in the UK (not from CKD kits imported from China) is reassuring because you can be reasonable confident that raw materials like Steel are of sufficient quality. It's why I won't buy a Chinese made car probably for at least 10 years until the wider component base is approaching EU or Japanese levels of quality.